People looking to step up the levels of their daily exercises may want to consider taking an MMA-style workout program, like UFC Fit and Tapout XT. Such workout programs effectively combine the moves from some martial arts into sequences that can train your body. Typically, these workout programs are heavier and more intense than the regular workout programs. So, what is the difference between UFC Fit vs Tapout XT? This is the question that we will try to answer below. Continue reading to determine the most suitable workout for you! UFC Fit is the first home workout program from the official UFC (Ultimate Fighting Championship). If you’ve been following the UFC matches, you are probably very interested in this workout. UFC Fit was developed by the fitness trainer and diet guru Mike Dolce. See also: Les Mills Combat vs Tapout XT. “FIT” actually stands for “Full-body Intensity Training”. UFC Fit is a program of full-body intensive training aimed to give you a UFC-style body. It is quite similar to the training program taken by UFC fighters. It goes for about 12 weeks, and it requires just two sets of light and heavy dumbbells. Every workout session takes about 40 minutes to complete. So, it is quite easy to conduct. For Women, the light set should be between 3 – 5 pounds and the heavy set should be between 5 – 10 pounds. For Men, the light set should be between 5 – 8 pounds and the heavy set should be between 10 – 15 pounds. The workout is divided into four segments, each spanning for about three weeks and consisting of exercises for strength, conditioning, and flexibility. A new high-intensity routine will be introduced each week. UFC Fit vs Tapout XT is not for a total beginner. You need a pretty solid base in order to take this workout. The moves will push you to the edge. It helps with your strength and cardio performance. It is effective to help people lose weight and to tone the body. On the other hand, Tapout XT is a high-pace and intensive MMA-style workout program designed by Mike Karpenko. 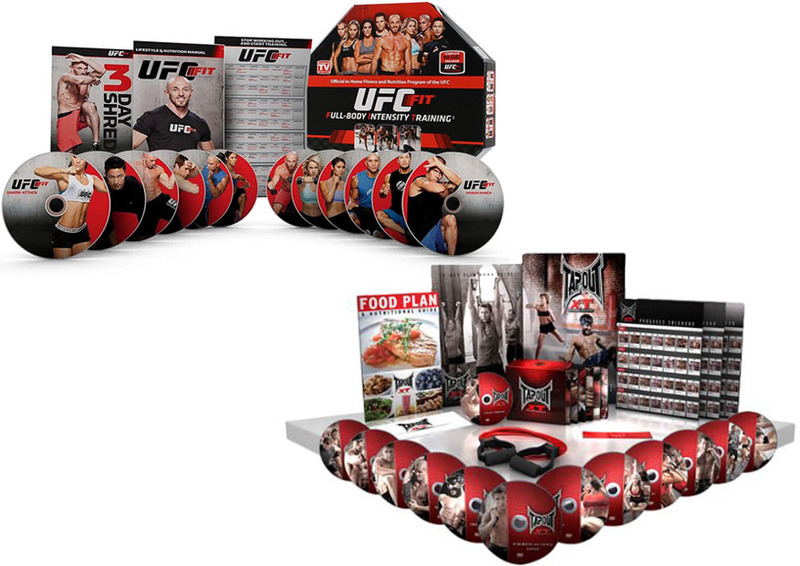 The DVDs also feature well-known MMA fighters who train along with you. It is based on the principle of RIPP (Rapid-fire, Interval, Precision, Power). It incorporates explosive bursts of kicks and strikes that are combined with targeted resistance and power exercises to fire your metabolism and build lean muscles. Tapout XT is very diverse. It has 15 workouts for multiple purposes. The different workouts are exciting, as they keep you on your toes. The program goes for 90 days and mixes up every 30 days. The workout sessions vary by duration, but each generally takes 40 – 60 minutes to complete. The needed equipment pieces are resistance bands and a yoga mat. Just like UFC Fit, Tapout XT is not very suitable for beginners. The moves are immediately heavy and intensive from day one, so you need a solid base to start with. Nevertheless, it will improve your cardio performance, endurance, and body shape. It is great if you want to lose at least ten pounds of body fat. - Designed for both men and women, this 12 week body makeover program will help you shed pounds, inches, and tone up! UFC Fit is suitable if you want to improve your strength as well as cardio performance. Remember that it needs some sets of dumbbells. On the other hand, Tapout XT is great for cardio performance and endurance. It only requires resistance bands and a yoga mat. Both workouts can help you lose weight.